Manilla to shut down July 1. Xero and ASB launch business to bank payments. Bancbox and Kingdom Trust Company partner to streamline the crowdfunding and P2P lending platform for the IRA investor. Actiance tops Forrester’s social risk and compliance product list. Strands hires new CEO, Erik Brieva. Dealstruck and Entrepreneurial Finance Lab named finalists in Core Innovators Challenge. FIS announces launch of FIS Instant Card to accelerate FI’s ability to provide new or replacement cards. Chris Skinner highlights the relationship between SmartyPig and ICICI Bank in a feature on Banking-as-a-Service. ZDnet takes a look at ShopKeep POS, including its recent $25 million investment form Thayer Street Partners. The Rock Trading Ltd. partners with Jumio for real-time ID verification services. KBC Bank Ireland embraces Temenos T24 core banking. Accounting Technology takes a look at Bill.com and its integration with Tax1099.com. Google Play Editor’s Choice features the Manilla Android app. BellaDati adds four new features. Trustly providing direct account payment solution for Groupon users. LendUp and Refundo team up to provide short-term loans for underbanked taxpayers waiting for refunds. 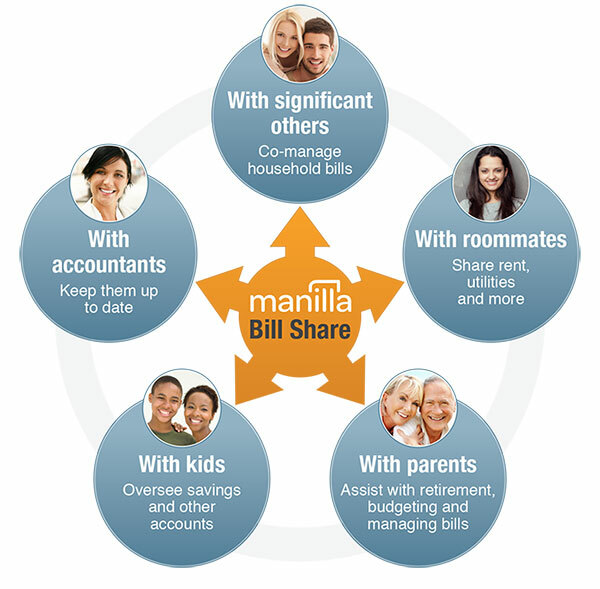 Manilla launches Bill Share to make managing family finances easier. CurrencyFair unveils their new website. The Seattle Times joins doxo to simplify bill delivery and payment for subscribers. Dynamics ePlate Visa Card adds 50th rewards partner. Sometimes the only thing more important than having a safe place for “your stuff” is a having a way – when you want to – to safely and easily share your stuff. To that end, Manilla is announcing Bill Share, the latest addition to their free, cloud-based bill-management service. “Whether you’re co-managing finances with your spouse, overseeing a college student’s accounts, helping elderly parents with their money or sharing information with your account, money management often involves more than one person, and that can become complicated,” said Manilla CEO Jim Schinella. Bill Share provides the sort of “shared finances” functionality that a number of personal finance management apps have begun to feature (such as Yodlee’s Best of Show winning app, Tandem). How so? Manilla users can take advantage of Bill Share simply by granting selected Manilla users access to their account. Users can then jointly manage finances, share information with financial professionals, and leave comments for others. The Manilla app with Bill Share is available for free from the iOS, Android, and Amazon Kindle Fire app stores. The app is not yet available online at Manilla.com. Founded in 2011 and headquartered in New York, Manila provides safe and secure cloud-based access to bills and personal finances. The company demoed its AOL Bill Manager technology at FinovateFall 2013. See Manilla’s presentation here. Lending Club announces more than 144,000 loans valued at more than $2B processed in 2013.
doxo announces $3.5 million in new funding. Capital Access Network changes its name to CAN Capital. Compass Plus survey reflects declining support for NFC amid growing popularity of mobile channel. Gartner places NICE in leaders quadrant of the 2013 Magic Quadrant for Contact Center Workforce Optimization. Wealthfront announces new ability to harvest losses on stocks that comprise an index. Flint Mobile raises $2 million from Verizon Investments. Mint, Manilla, SigFig, Jemstep and Planwise featured in Kiplinger’s list of smart online tools to manage finances. HPC Wire takes a look at the partnership between Toopher and Texas Advanced Computing Center. Regulators green light IDology plans for New Jersey expansion. Jackson Free Press uses data from Manilla to source column on student loan debt. Michigan-based ECCU introduces a responsive designed website powered by Banno. MyBankTracker reports: SimpleTuition’s SmarterBank to Shut Down Due to Low Participation. International Business times considers how Holvi and TransferWise are revolutionizing banking. Tagit powering Maybank P2P m-payment Service in Singapore. BancVue’s Kasasa wins Five 2013 MarCom Awards. Betterment CEO Joe Stein talks about the online RIA industry with RIA Biz.